The films of Jean-Luc Godard, that great iconoclast of the French New Wave, have always been so mired in an esoteric miasma of philosophical/pop-cultural minutiae that attempting to decode them for their intended interior meanings is an exercise not only of futility but of insanity. Not only is an exhaustive knowledge of Marxist philosophy essential, but so is an encyclopedic familiarity with the cinema, both American and European, patrician and popular. So if only Godard can truly understand and appreciate the films of Godard, why is he such a cause célèbre among filmmakers and critics? Why are his bizarre, seemingly indecipherable films still celebrated and venerated after decades while other French directors have faded into obscurity? Perhaps because watching a Godard film is like coming face-to-face with the astonishing potentialities of the cinematic medium. His debut film Breathless (1960), a kind of tribute and deconstruction of American crime movies, shocked the world with its bold use of jump-cut editing which subverted time-honored norms of cinematic storytelling. Alphaville (1965), another love/hate letter to American genre films, mishmashed sci-fi and film noir to create a dystopic nightmare where a trench-coat and fedora-wearing secret agent navigates a world ruled by a sentient computer which has outlawed emotion and poetry and executes dissidents by having them shot and drowned in indoor swimming pools. And Weekend (1967), one of his most notorious films, follows a bourgeois couple as they navigate a French countryside populated by car accidents, revolutionaries, and cannibals. By the late 1960s, Godard had become so consumed with zeal for Maoist ideology that his films transformed into incomprehensible, self-reflexive exercises in hostility towards general audiences not familiar (and immediately sympathetic) to his revolutionary politics. But nestled between these cinematic projects and his earlier “genre” films is the wondrous Pierrot le Fou (1965). 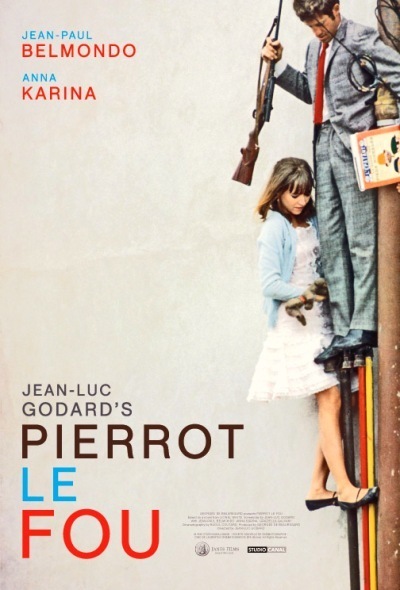 Much like his later film Weekend, Pierrot le Fou focuses on a bourgeois couple on the run through the European countryside. 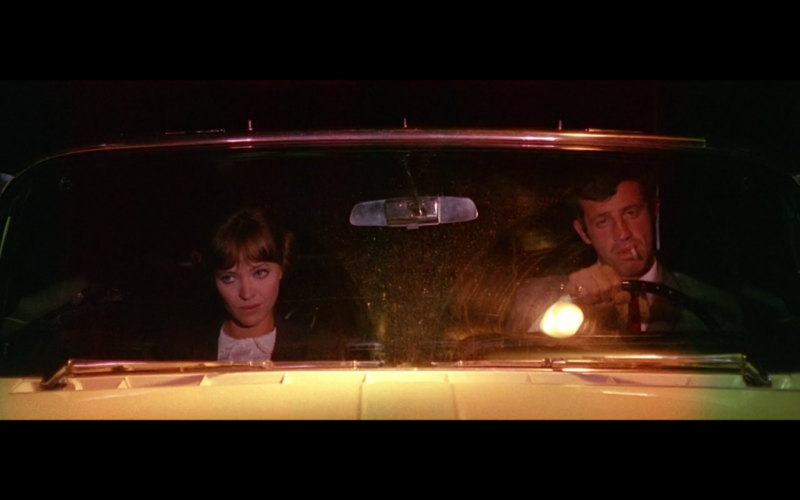 Very loosely based on the novel Obsession by American crime novelist Lionel White, it follows ex-television broadcaster Ferdinand Griffon (Jean-Paul Belmondo) and his on-again, off-again girlfriend Marianne Renoir (Anna Karina) as they abandon their lives and flee from far-right French paramilitary terrorists. 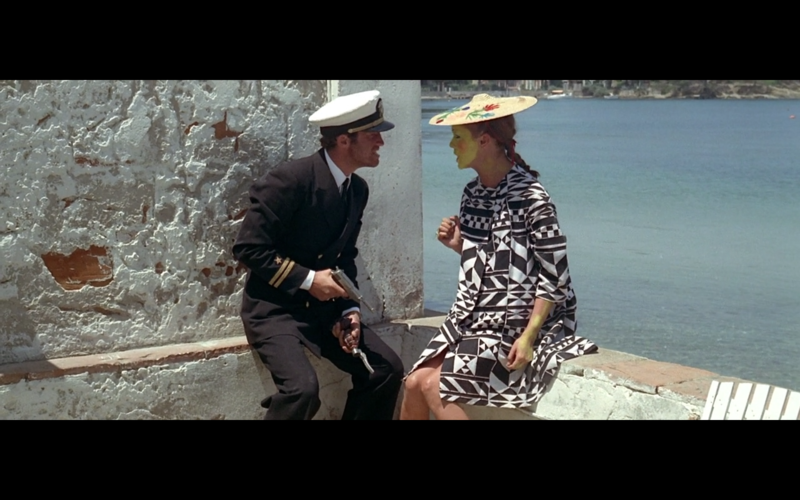 And though based on a crime novel, Godard seems to take pains to either subvert or ignore all of the genre’s traditional story beats: Ferdinand and Marianne ruin the narrative’s tension by breaking the fourth wall and addressing the audience; while being pursued they pause and relax in the French Riviera, cavorting, philosophizing, and performing impromptu Hollywood-esque musical numbers; gritty realism is eschewed in favor of candy-colored cinematography (courtesy of Raoul Coutard) that crackles like a comic book and scenes of violence that seem like afterthoughts. 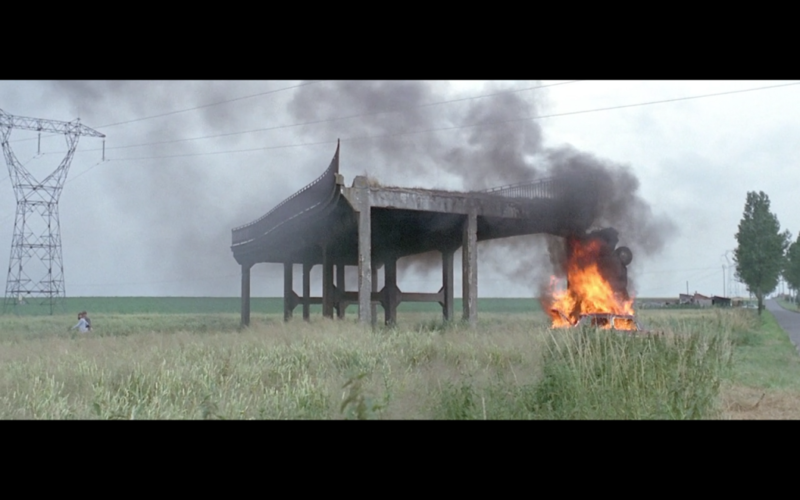 One of the film’s most memorable images—no mean feat considering that Pierrot le Fou is comprised almost entirely of memorable images—occurs when Ferdinand and Marianne burn their car alongside a devastating wreck they come across in order to fake their own death. The discovered wreck is a nasty piece of work: a couple driving on a highway bridge accidentally drove over the side, smashing into the ground and becoming stuck in a vertical position. But as Ferdinand and Marianne walk away from the smouldering remains of both cars, the camera pulls back and reveals that the bridge wasn’t a bridge at all: it was merely a section of bridge a few dozen yards in length with no entrance or exit ramp. What’s more, as the camera starts to pan left, we realize that this modern, industrial bridge section was constructed in the middle of the uninhabited French countryside. Here we see the inner workings of Godard’s method: what’s important is that there is a bridge, that there is a wreck that Ferdinand and Marianne can use to further their escape. They are mere plot devices. For the narrative to continue, Ferdinand and Marianna have to discover a method by which to elude their pursuers. So the narrative summons one out of thin air. 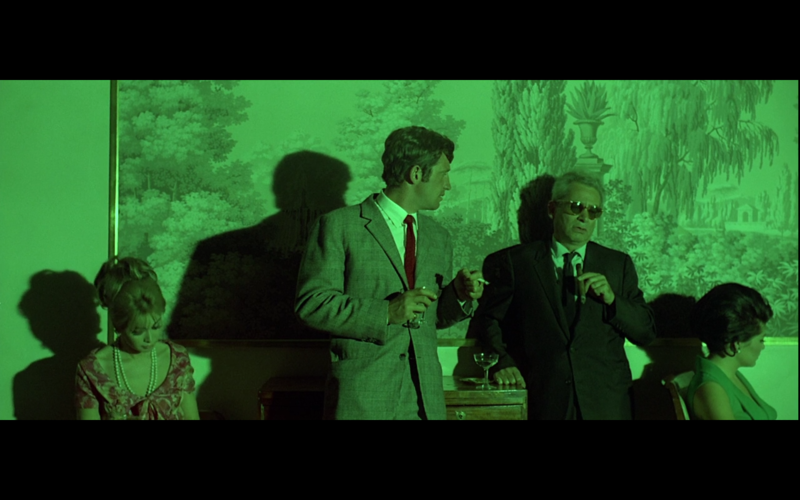 Godard highlights the artificiality of such convenient narrative developments by making the artifice literal. In one of the earliest scenes, Ferdinand attends a dull party where he drifts from one boring conversation to another. Eventually he stops next to an old man in sunglasses chewing a cigar. They begin to talk. The man is Samuel Fuller, an American director and one of Godard’s real-life idols. “I’ve always wanted to know exactly what cinema is,” Ferdinand asks. 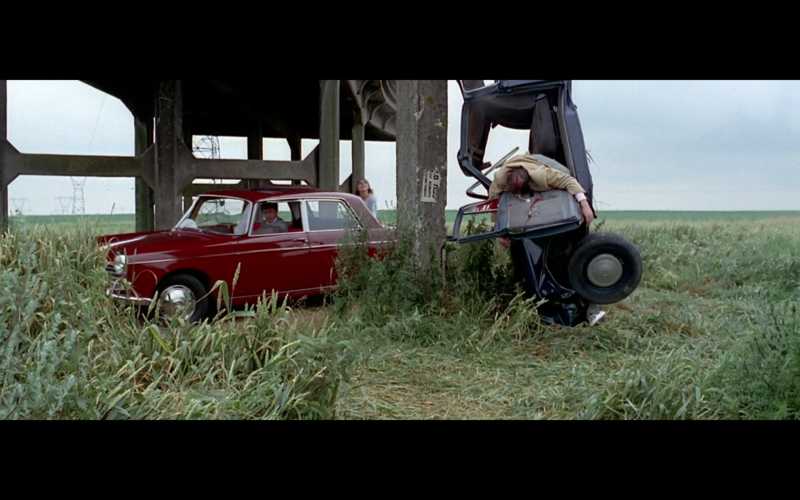 Pierrot le Fou certainly has love. It certainly has hate, action, and violence. And it certainly has more than its fair share of death. How curious, then, that Godard seemed to take pains to strip the film, and by extension its audience, of all emotional impact. Some would call this brilliance. Some would call this madness. 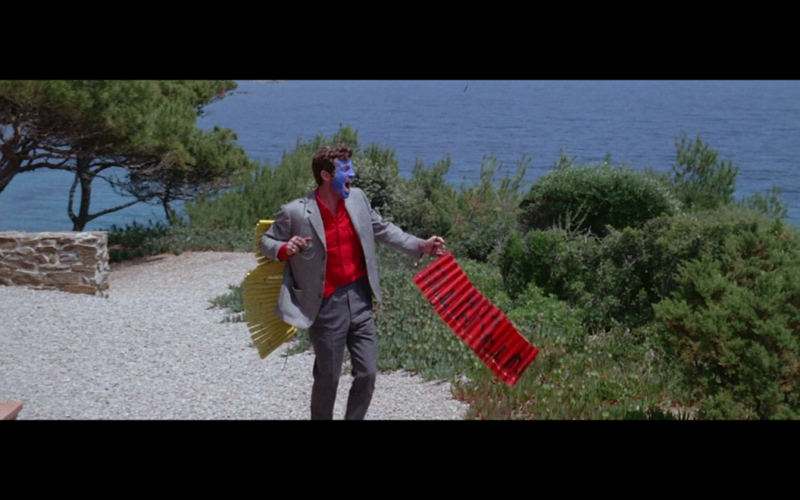 Call it what you will, the fact remains that Pierrot le Fou is, in a word, cinema.